Meet Primordial Chaos and earn their Boons. Unlock the Infernal Contract for a greater challenge. New and improved look for the player character. New Chambers, balance changes, and much more! 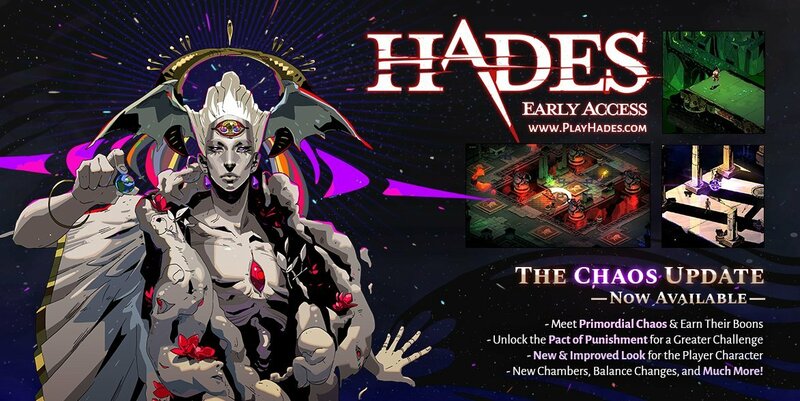 The Chaos Update has been added to Hades, bringing with it a plethora of new content and improvements. Addressing the new Chaos Update, Supergiant opens their patch notes summary by stating: "Our first Major Update is here! Your feedback helped us prioritize features that add variety and lasting value, to help keep things fresh as we continue to create more content. Note we'll likely post several smaller patches after this, then shift focus to next month's big update!" Wondering what has been added and what has been changed? 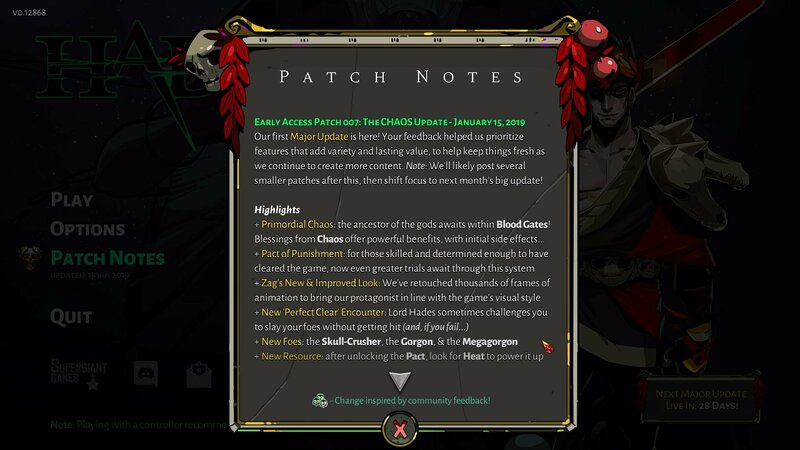 Below, we've listed the full patch notes for the Chaos Update from the information provided by Supergiant! Primordial Chaos: The ancestor of the gods awaits within Blood Gates! Blessings from Chaos offer powerful benefits, with initial side effects. Pact of Punishment: For those skilled and determined enough to have cleared the game, now even greater trials await through this system. Zag's New & Improved Look: We've retouched thousands of frames of animation to bring our protagonist in line with the game's visual style. New 'Perfect Clear' Encounter: Lord Hades sometimes challenges you to slay your foes without getting hit. New Foes: The Skull-Crusher, the Gorgon, and the Megagorgon. New Resource: After unlocking the Pact, look for Heat to power it up. Wretched Broker: Exchange resources in the House of Hades. Infernal Troves: More reward variety; some take Skeleton Keys. Last moments of Survival Encounters no longer extended. Reduced auto-aim priority on invincible foes. Well of Charon will offer another item if you bought all Decor. You now briefly become invincible after taking damage in bursts. Armored foes absorb any damage that breaks their Armor. Armor values generally reduced to make up for the previous change. Rubble is destroyed when foes collide with it. Common urns in Asphodel no longer drop money. Ambrosia no longer sold by Charon. Blood Gates no longer available in early escape attempts. Dash now briefly stuns most unarmored foes. Shield of Chaos: Special returns sooner; slightly reduced Bull Rush recovery time. Critical effects have a reduced change, but deal more damage. Lightning Flourish (Zeus): Increased damage. Thunder Dash (Zeus): Effect no longer targets invulnerable foes. Divine Flourish (Athena): Slightly increased damage; reduced Deflect duration on Special (Blade only). Tidal Strike (Poseidon): Slightly increased damage; reduced knockback. Tidal Flourish (Poseidon): Increased damage. Sunken Treasure (Poseidon): Increased healing and other rewards. Ocean's Bounty (Poseidon): Reduced money bonus. Slicing Shot (Ares): Increased base damage. Super Nova (Daedalus - Blade): Reduced damage and area of effect. Sudden Sunder (Daedalus - Blade): Fixed an issue where you could Blink repeatedly. Triple Shot (Daedalus - Bow): Widened attack arc. Sudden Rush (Daedalus - Shield): Charges even faster. Minotaur Rush (Daedalus - Shield): Increased damage. Javelin Throw (Daedalus - Spear): Increased damage. Trick Toss (Daedalus - Spear): Removed speed bonus (since the base throw is now faster). Bloodless: Flank you more effectively; slightly delayed attack point. Inferno-Bombers: Now drop one bomb when slain (instead of three). Voidstone: Increased shielding range; effect ceases once destroyed. Bone Hydra: Further tuning to aspects of this encounter. Megaera: Slightly reduced health; other misc. fixes and changes. Re-tuned various Asphodel foes to make room for the new varieties. Normalized 'Backstab' areas on foes. Infernal Soul: Reduced max rank (invested Darkness will be refunded). Quick Temper: Removed from the game and replaced with Boiling Blood (invested Darkness will be refunded). Boiling Blood (New): Gives dmg. bonus after hitting foes with Cast. All Keepsakes re-scaled; they now rank up through repeated use. You can now switch Keepsakes only once after clearing Tartarus. Black Shawl (Nyx): Now restores Health when you earn Darkness. Cosmic Egg (Chaos): Added to the game. Daedalus Hammer (Charon): Increased shop cost. Boons (Charon): Slightly reduced shop cost. Centaur Heart (Charon): Slightly reduced shop cost. Eye of Lamia (Well): Slightly increased shop cost. Light of Ixion (Well): No longer sold during early escape attempts. New Chambers: 3 added to Tartarus, 3 added to Asphodel. Adjustments and fixes to various chambers. Artemis: The Goddess of the Hunt shows herself at last. Cast: Your Bloodstones have an updated look. Hades Remembrance sequences have a new look. New cosmetic obstacles added to various chambers. The Chaos Update adds Primordial Chaos and their unique Boons to Hades. Victory Screen: Successfully complete a run to see this summary. Screenshot: F11 (default) to take screenshots anywhere in-game. Report Bug: F10 (default) to report a bug anywhere in-game (note this no longer for misc. feedback; please give us feedback in Discord). Main Menu: Improvements, plus Chaos Update presentation. Updated player health bar; more improvements planned. Updated look of Aim Previews for various weapons and abilities. Improved feedback on some button states. Show Timer: Toggle this to track your best time. Playback Device: Set your preferred audio device in-game. Mouse Lock: Lock your mouse cursor in windowed display modes. Dead Zone: Tune your controller's neutral position. Captions remain visible during scene transitions. 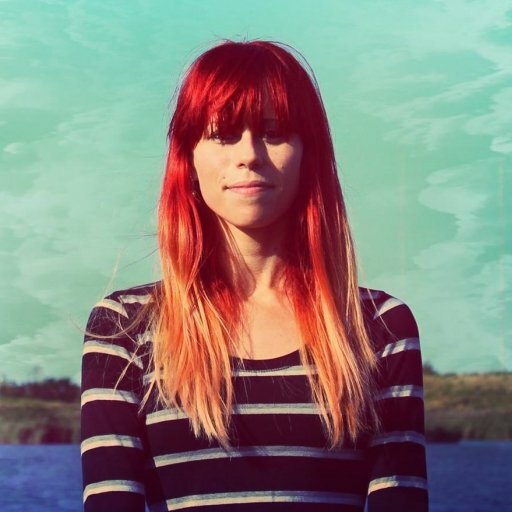 Primordial Chaos: Added new musical track. Added voice lines for Chaos, Zagreus, Hades, Achilles, and Hypnos. Added Zagreus voice events for various gameplay contexts. Added several new character events in the House of Hades. Achilles should give the Codex more reliably early on. Added Codex entries for Chaos, new foes, and Heat. Increased max Gift level for Olympians, Nyx, Skelly, and Cerberus. Updated descriptions of some Books, Keepsakes, and Upgrades. Keepsakes re-arranged in the Display Case. Credits: Primordial Chaos added to the Voice Cast. Improved feedback when your last Death Defiance is used up. Added feedback if you try using the Codex before it's unlocked. Can no longer buy Life Essence (Well) at full health. Small amounts of Darkness awarded directly instead of in pick-ups. Game pauses automatically if controller disconnect is detected. Fixed a crash if your character died will viewing the Codex. Fixed an issue where Dusa would vanish rather than fly away. Fixed a visual issue with Boss Health Bars not fully depleting. After reviewing the patch notes, there are several things we're excited to try out including new Boons from Primordial Chaos and updates to existing Boons which buff those offered by Zeus and Poseidon. As requested by Hades players, these buffs will hopefully make Boons outside of the ones offered by Aphrodite more viable. Additional Chambers have been added to existing levels in Hades, though players will have to wait a little bit longer to graduate from Asphodel. Blood Gates have been improved overall, which is something we've requested as prior to the Chaos Update, spending health to enter Blood Gates never felt worthwhile when weighed against the rewards offered. Be sure to check back, as we'll post new guides as we dig into the latest changes made to Hades. In the meantime, what do you think of the Chaos Update? Are you excited to battle new foes, or are you itching to meet up with Primordial Chaos? Let us know down in the comments below. To purchase and play Hades, be sure to check out the game's page on the Epic Games Store!